It’s that time of year again. The time that many people dread, but some few, perhaps, may secretly look forward to. The start of a new school year. Each August institutions of learning reopen, and many return to their halls, some kicking and screaming the entire way there (and not necessarily all of them students). I would hazard a bet that it was no different ninety years ago for those attending the Latter-day Saints College in Salt Lake City, Utah. 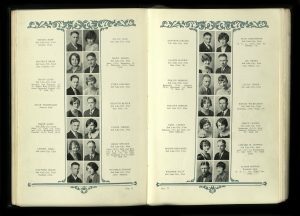 Despite the once-felt pain of starting those many school years, most of us bought the so called “yearbooks,” which we find ourselves, against our better judgement, pulling from a box or off a dusty shelf to peruse every few years. They sure bring back memories, don’t they? Whether they bring back good memories or bad, they do provide a record of the past. 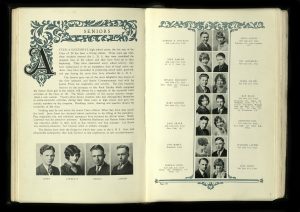 As terrible as some of those school pictures are or as silly as some of the end-of-year signings can be, yearbooks often become very interesting historical records. 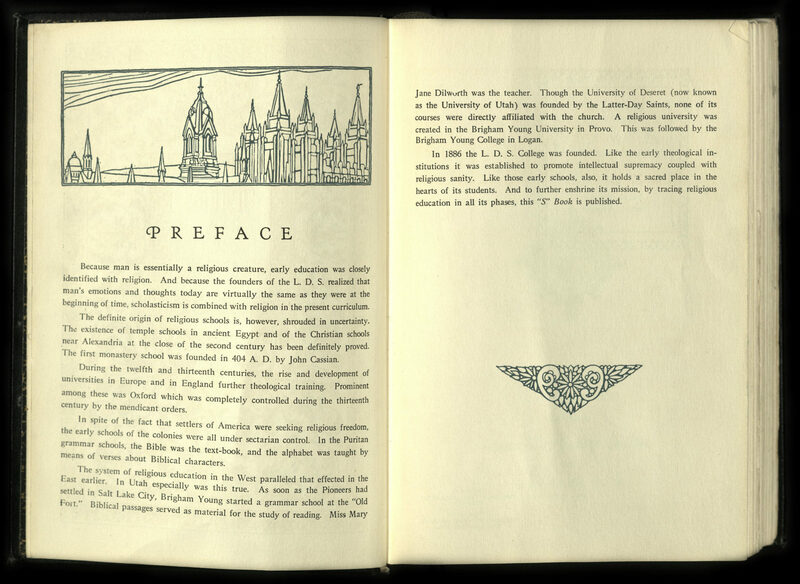 Take, for example, a 1928 yearbook (The “S” Book) from LDS College bought by Grace Louise Cannon. 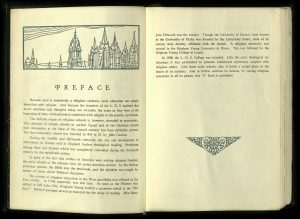 This book has some interesting aspects which should make us happy Grace didn’t do what most of us are tempted to do when looking at our own yearbooks, namely, commit them to the landfill. LDS College, sometimes called LDS High School, was a secondary school located in Salt Lake City, Utah operated by The Church of Jesus Christ of Latter-day Saints. The school was closely associated with Latter-day Saints’ University, the last vestiges of which are now LDS Business College. 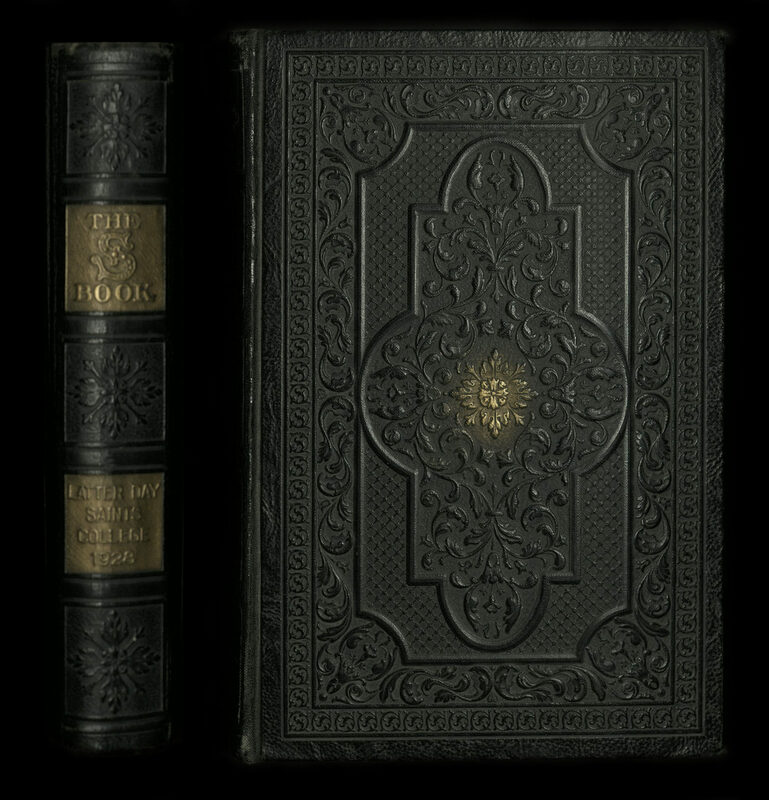 Both trace their beginnings to the Salt Lake Stake Academy, which started in 1886. 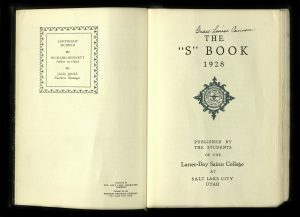 The LDS High School name was adopted in 1927. 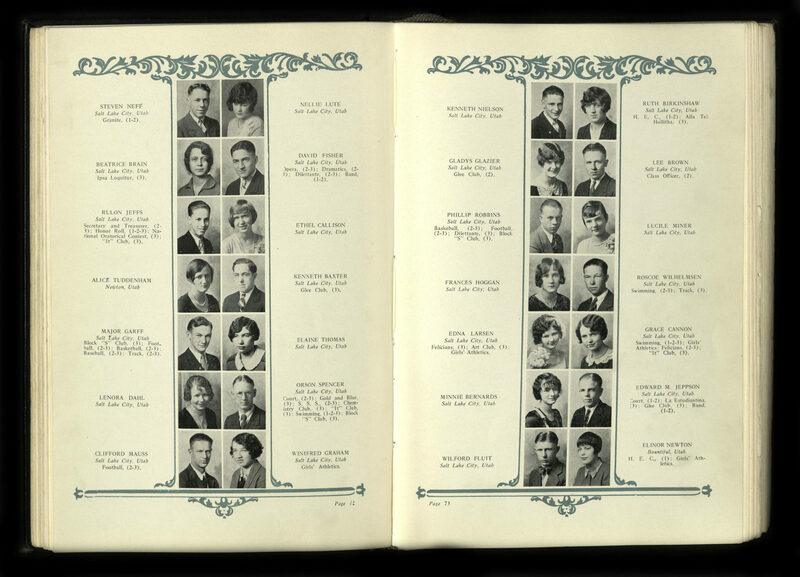 In 1931, LDS High School was closed, leaving about 1,000 students to attend public high schools, most notably the newly built South High, which opened in the fall of the same year. The closure was a late example of a process of closing most LDS run secondary schools in Utah. 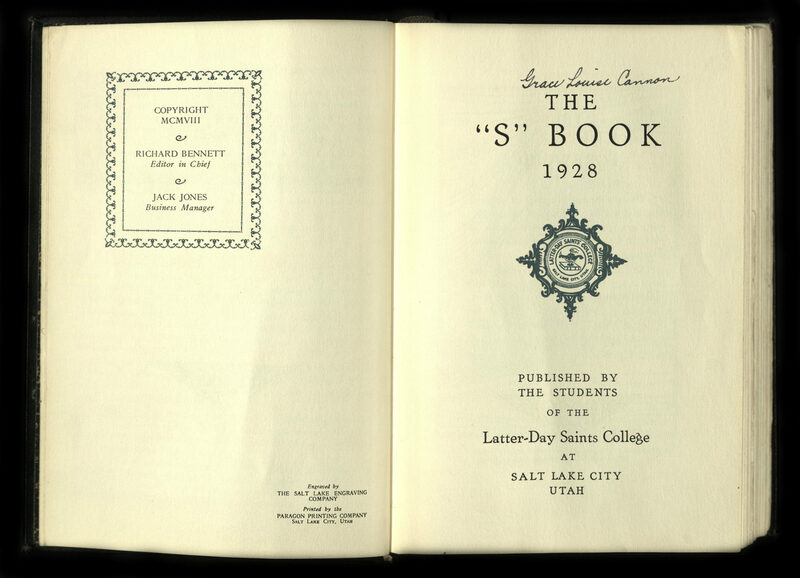 Grace was a senior the year (1928) this “S” Book was compiled and she had some very interesting classmates: Gordon B. Hinckley and Rulon T. Jeffs. Gordon B. Hinckley went on to become the 15th president of the Church of Jesus Christ of Latter-day Saints, serving in that position from March 1995 until his death in January 2008. Rulon T. Jeffs, on the other hand, became President of the Fundamentalist Church of Jesus Christ of Latter-Day Saints (FLDS), a Mormon fundamentalist organization based in Colorado City, Arizona, from 1986 until his death in 2002. The FLDS Church is one of the largest Mormon fundamentalist denominations and one of the largest organizations in the United States whose members practice polygamy. 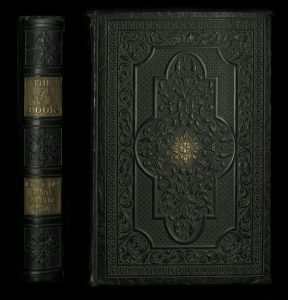 It emerged in the early 20th century when its founding members left The Church of Jesus Christ of Latter-day Saints. The split occurred largely because of the LDS Church’s suspension of the practice of polygamy and its decision to excommunicate its members who chose to continue the practice. Who would have guessed that the concurrent leaders (1995 – 2002) of these two opposing organizations were once high school classmates? 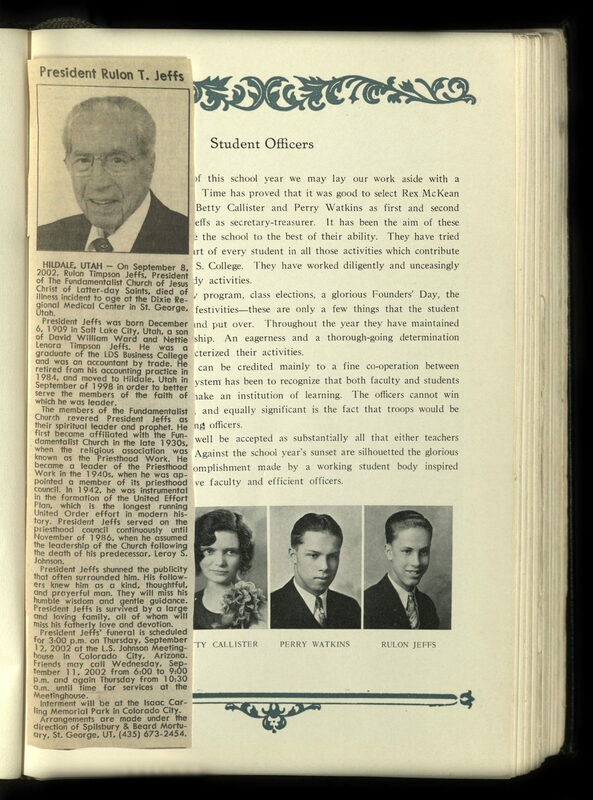 After attending LDS College (High School) with Hinckley and Jeffs, Grace went on to study at the University of Utah. She graduated in 1935 and was married to J. Quayle Ward in September of that year by David O. McKay, then second counselor in the First Presidency of the LDS Church. She became a school teacher in Granite School District (where she taught for sixteen years), raised five children, and died in July of 1997 at the age of 86. She undoubtedly achieved many great accomplishments. As arbitrary as it may sound, I would rank her saving this 1928 “S” Book as one of them. 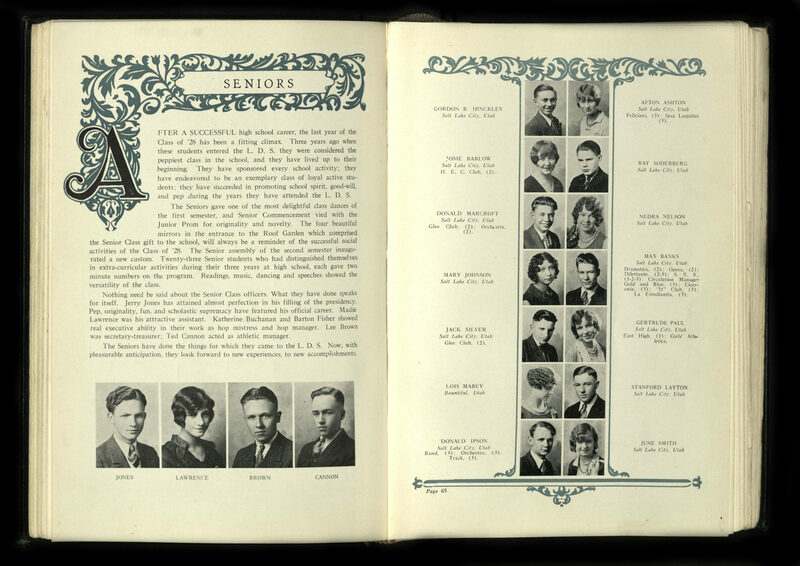 So as tempting as it may be to commit your yearbooks to the landfill, think of Grace and how her yearbook has helped to make us a little more aware of obscure historical fact, and just hold onto them. Who knows what they’ll tell us in ninety years.